We’d love your help. Let us know what’s wrong with this preview of The Power of the Parasite by Jennifer L. Holm. Introducing Squish—a hilarious, action packed graphic novel series from the award-winning creators of Babymouse! Filled with superheroes, comics within comics, and gross-out science, Squish is perfect for fans of Dav Pilkey's Captain Underpants, Dan Gutman's Weird School, and Jarrett Krosoczka's Lunch Lady. School's out! Everyone's favorite amoeba is headed to summer camp! Introducing Squish—a hilarious, action packed graphic novel series from the award-winning creators of Babymouse! Filled with superheroes, comics within comics, and gross-out science, Squish is perfect for fans of Dav Pilkey's Captain Underpants, Dan Gutman's Weird School, and Jarrett Krosoczka's Lunch Lady. School's out! Everyone's favorite amoeba is headed to summer camp! But instead of SUPER AWESOME FUN, Squish's summer is turning out to be SUPER AWESOME TERRIFYING! For one thing, Squish can't swim. And to make matters worse, his new camp friend is a Hydra (scientific fact: A hydra's tentacles can paralyze you!). Will Squish sink or will he swim this summer? (And what's up with Pod and black holes anyways??) Find out the answers to these questions and more in the super spectacular adventure, Squish #4: The Power of the Parasite. Summer reading has never been so slimey! Yowza! You can draw comics, too! Look in the back to find out how to draw one of the Squish characters! Also includes instructions for a sensational science experiment you can do at home! Shazam! Here's what people are saying about everyone's favorite amoeba! "An energetic, good-hearted escapade, one that young readers will enjoy." * "Hilarious. If ever a new series deserved to go viral, this one does." To ask other readers questions about The Power of the Parasite, please sign up. 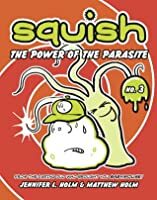 “Squish-The Power of the Parasite” by Jennifer Holm and Matthew Holm is a children’s graphic novel that tells the story of Squish- an amoeba- who is reluctant in attending summer camp where he is to learn to swim. As Squish once had a tragic experience in learning to swim he is sticks to the side of the pool ledge while all the other campers seem to be having a blast swimming. It is at this camp where Squish meets Basil- who challenges Squish in choosing right from wrong as he pushes “fun” a bit “Squish-The Power of the Parasite” by Jennifer Holm and Matthew Holm is a children’s graphic novel that tells the story of Squish- an amoeba- who is reluctant in attending summer camp where he is to learn to swim. As Squish once had a tragic experience in learning to swim he is sticks to the side of the pool ledge while all the other campers seem to be having a blast swimming. It is at this camp where Squish meets Basil- who challenges Squish in choosing right from wrong as he pushes “fun” a bit too far. I think this book is perfect for those children who are reluctant to read. The illustrations are comic book like as they are black, white, and green. The green causes readers to focus to specific parts of the illustrations as it makes the picture pop! As Squish has to choose between right and wrong I think this a great book for students as it teaches them that sometimes we may be faced in a position where you may have to stand your grand in what you believe. Overall, I think children would love this graphic novel as it is both funny and witty, and children can relate to the lesson it poses. Squish is fast becoming a favorite of mine. I think the emphasis on making good choices when faced with difficult situations is a great addition to an already fun character. Additionally, the narration arrows are quite funny. The story Squish by Jennifer L. Holm tellAt swim camp, Squish's new friend Basil helps him avoid learning to swim with pranks that sometimes go too far, but the comic book exploits of Squish's idol, Super Amoeba, help him deal with Basil and conquer his fear. Squish's summer is off to a rough start. When forced to pick between swim camp and ballet camp, he chooses swimming only to find out his best friends Peggy and Pod are enrolled in ballet camp instead. Squish reluctantly trudges off to swim camp. While the other amoebas at the pool are having super awesome fun, Squish is not. The pool staff don't even have his name right! They think he is Squash not Squish. While other little amoebas splash and swim, Squish sticks to pool ledge as he remembers wha Squish's summer is off to a rough start. When forced to pick between swim camp and ballet camp, he chooses swimming only to find out his best friends Peggy and Pod are enrolled in ballet camp instead. Squish reluctantly trudges off to swim camp. While the other amoebas at the pool are having super awesome fun, Squish is not. The pool staff don't even have his name right! They think he is Squash not Squish. While other little amoebas splash and swim, Squish sticks to pool ledge as he remembers what happened the last time he attempted to swim. Even though his teacher tries to encourage him to try, Squish invents excuses not to get wet. A supposed bathroom trip results in several hours of reading his favorite comic. That comic is what leads him to making a new friend. Basil the hydra loves Super Amoeba too. Now Squish has someone to hang out with, someone who loves goofing off and pulling pranks. Now Squish can't wait to get to camp even if he still won't try swimming, but that fun starts to turn dangerous as Basil pushes the limit further in the name of fun. When Basil stuns their swim coach, Squish will have to make a decision. Parallel to Squish's story is the story of comic book hero Super Amoeba dealing with the arrival of the Parasite, a hero Super Amoeba met several years earlier. At first, Parasite offers to help Super Amoeba but Squish's favorite hero will have some tough decisions to make when the Parasite displays his true nature. The green and white illustrations in this book add humor to this fast paced graphic novel. I loved all the different notes that caption the different characters and events in the story. I also like the little bits of science snuck in as well. The Holms have created a great new volume in this series with a friendship theme that many kids will connect with. Students will have super awesome fun with this book! The whole Squish series by Jennifer and Matt Holm is fun, but Squish #3 is "super awesome fun." It's summer vacation and while his friends attend ballet camp (Pod has other motives for attendance including disrupting the universe vs learning to spin on his toes) Squish must attend swim camp at the insistence of his mother who reminds him that amoebas should know how to swim as they live in ponds (an important scientific fact offered early on in this work). But getting in the pool could be one of S The whole Squish series by Jennifer and Matt Holm is fun, but Squish #3 is "super awesome fun." But getting in the pool could be one of Squish's greatest adventures of all. It's not "super awesome fun" to sit at the side of the pool while everyone else jumps in, so when Basil, a hydra befriends Squish and begins to show him alternative sources of "super awesome fun" it is fun at first, but slowly pranks and avoidance of the daily lessons begin to strain the relationship. The backdrop of Super Amoeba, a recurring comic super hero that appears in the Squish books plays out nicely here when Super Amoeba teams up with a super parasite who lives up to his name. This title would work nicely to open up conversations about healthy relationships and what both parties bring to those relationships. I also like that Pod is excited about attending ballet camp. In this 3rd installment of the popular Squish graphic novel series, Squish joins a swimming class and makes a new friend, Basil, who is a poisonous hydra. Instead of the "Super Awesome Fun" he planned, Squish finds that swimming and friendship are scarier than he predicted. I cannot wait for Squish #4 this fall. My students love Squish! This book has Nerdy winner written all over it. The best Holm GN so far. Can't wait for the book to come out. My fourth graders NEED this book and the lesson they will learn from reading it. This book is called “Squish”by Jennifer L.Holm.The story in this book is about Squish and his friend Basil.Squish is an amoeba,Basil is an hydra,his tentacles can paralyze prey and his body can grow back again.In the beginning of the story,Squish’s mother let him go to swimming camp because they get a summer vacation.But Squish doesn’t like swim,so he go to bathroom for read cartoon book.Suddenly Basil see him and that book,and he said he also like the book.They talk a lot so they be come frien This book is called “Squish”by Jennifer L.Holm.The story in this book is about Squish and his friend Basil.Squish is an amoeba,Basil is an hydra,his tentacles can paralyze prey and his body can grow back again.In the beginning of the story,Squish’s mother let him go to swimming camp because they get a summer vacation.But Squish doesn’t like swim,so he go to bathroom for read cartoon book.Suddenly Basil see him and that book,and he said he also like the book.They talk a lot so they be come friends.And then they do something super awesome fun on that day. The next day,their swimming teacher tell something about swim safety to the student,Squish think it’s super awesome boring,so Basil said, “Do you want to see something super awesome fun?”and then he use his tentacles to paralyze a student.Suddenly,the student feel numbness for his body,and he fell to the swimming pool,lots of water spill on the teacher.Then all of the students laugh at him and that teacher.But the teacher doesn’t know anything! A few days later,the teacher find Squish and Basil doesn’t like jump on the diving board.So he wants to jump from the diving board for them,and let them try to do it.But when the teacher run to the diving board,Basil said, “do you want ton see something super awesome fun?”.Then he use his tentacles to paralyze their teacher’s feet.Suddenly,the teacher fell on the ground.But the teacher doesn’t know that,he thought this is an accident.Basil feel funny for this thing but Squish doesn’t,he think it is impolite to make fun form teacher. The next day morning,Squish go to swimming camp very early to see his teacher.And he tell to teacher what happened on yesterday,then he apologize to the teacher.He said don’t worry about that.Later Basil meet Squish,he said, “ do you want to see something super awesome fun?”.But Squish said, “No really...”because he doesn’t want to see Basil makes fun on others again.During the lunch,Basil said to other student, “do you want to see something super awesome fun?”,and then he makes fun on Squish likes before he made fun on others.Squish feel numbness on his whole bodies,and he dance very crazy.Suddenly,there is a very big vortex in the sky.And the end of the story is the vortex cuck Basil to the sky.So he disappear in the sky forever. An adorable story about Squish an amoeba that makes a friend at swim camp. While I think having the author push a gender normative is silly especially with a non binary creature, the plot of this story is relevant and charming. Squish's story parallels and is emboldened by his reading of his comic book heroes. He in turn learns how to handle toxic friendships. Which is a powerful topic for both children and adults alike. This story is about a thing call squish , he went to swimming camp and meet a friend cell Basil they don't want to swim at the end the basil mischief squish and squish must dance so he get basil into his stomach..
It’s talk about Squish make a friend Basil.And Basil teach him how to tease the other.in the beginning, the Squish think it is very funny.but in the end, Squish know how terrible it is.And Squish let the power to take the Basil out. This book is very quick, but it is kind of boring. It was pretty good. It was a classic squish book teaching a lesson. The Power of the Parasite is the third book in the Squish series by Babymouse creators Jennifer L. Holm and Matthew Holm. In this episode, Squish, a pond-dwelling amoeba, is sent to summer swim camp because his mom thinks amoebas who live in ponds should know how to swim. While sitting on the sidelines, too scared to actually get in the pool, he meets a hydra named Basil. Squish and Basil share a love of Super Amoeba comic books, which Squish reads in every volume of the series so far, and they The Power of the Parasite is the third book in the Squish series by Babymouse creators Jennifer L. Holm and Matthew Holm. In this episode, Squish, a pond-dwelling amoeba, is sent to summer swim camp because his mom thinks amoebas who live in ponds should know how to swim. While sitting on the sidelines, too scared to actually get in the pool, he meets a hydra named Basil. Squish and Basil share a love of Super Amoeba comic books, which Squish reads in every volume of the series so far, and they laugh themselves silly over the swim coach’s insistence that swimming is “super awesome fun!” Before long, though, Basil’s sense of humor reveals a cruel streak, and Squish finds himself wondering if their fun is going too far. What I like about Jennifer and Matthew Holm’s work is that it finds the fun and humor in childhood experiences. Both Babymouse and Squish are successful series, I think, because of their unique, clever perspectives on school, adults, family, friendship, and in Squish’s case, science. As I’ve said in the past about the Little Wings chapter book series, there is something really appealing about realistic problems set in fantastical and unusual settings. There isn’t much new about the storyline in this book - lots of books have dealt with the idea of bullying or peer pressure in some way, but because the setting is a pond and the characters are hydras and amoebas, the entire story becomes fresh and interesting to its audience, even if that audience has read the basic plotline before. I also think the way each organism is introduced to the reader is a nice way to incorporate some scientific knowledge into the book without losing the book’s entertainment value. I wasn’t even sure myself of the difference between an amoeba, a paramecium, and a hydra before getting into this series, and it was fun to be reminded by these quirky comics characters. The only thing I do need to admit is that this book isn’t as funny as even the least amusing Babymouse book. Babymouse’s sarcasm really resonates with me, as does her snarky banter with the narrator, but Squish is more earnest, and there is a bit more of a moral to his story. I also recently book talked Babymouse: Mad Scientist to a third grade class, and all of them had read Babymouse, but none had heard of Squish. Squish is cute, and his stories are fun and fast-paced, but they just don’t compare to the excellence of the Babymouse books. I've been hearing about Jennifer L. Holm and Matthew Holm's work in comics for kids for years, but I never read anything by them until the Cybils pushed me into it. I'm happy my panelist duties pushed me into it, because I absolutely love the Squish series. In THE POWER OF THE PARASITE, our intrepid hero - the amoeba Squish - is forced to go to swim camp by his mom. (The other choice was ballet camp. While Squish makes several jokes about it, the text and other characters point out that ballet is I've been hearing about Jennifer L. Holm and Matthew Holm's work in comics for kids for years, but I never read anything by them until the Cybils pushed me into it. I'm happy my panelist duties pushed me into it, because I absolutely love the Squish series. In THE POWER OF THE PARASITE, our intrepid hero - the amoeba Squish - is forced to go to swim camp by his mom. (The other choice was ballet camp. While Squish makes several jokes about it, the text and other characters point out that ballet is pretty cool.) There he meets Basil, a hydra. (Hydras get their name from the fact that they can grow back body parts - also pretty cool.) Meanwhile, the latest issue of Super Amoeba - Squish's favorite comic - has the eponymous superhero making friends with fellow crime fighter Paralyzer. But both new friends might be bullies! I enjoy the dual structure of the Squish books. The Super Amoeba comics are funny and reinforce the themes of the main story. Both parts are excellently drawn. The lines are bold and expressive and the character design is well done, even with a blob for the protagonist. I can see why people have been talking about the Holms for years! This is the third book in the Squish series by Jennifer L. Holm and Matthew Holm. Our youngest ripped through the Babymouse series in no time and while we're waiting for the next book in that series, she decided she wanted to try out this one. I may just be a boring old middle-aged lady, but I think that the story in this book isn't nearly as compelling or charming as the Babymouse stories. In fact, the characters are pretty irritating and flat. But our youngest really liked them, and she's eager This is the third book in the Squish series by Jennifer L. Holm and Matthew Holm. Our youngest ripped through the Babymouse series in no time and while we're waiting for the next book in that series, she decided she wanted to try out this one. The illustrations are good and since it's a graphic novel, they tell most of the story along with the dialogue. But once again, they just don't have the charm of the girl in pink. I guess the one thing that it's got going for it is likely to appeal more to boys. In this third installment of the Squish series, Squish goes to swim camp and makes a new friend. But when this new friend, who happens to be a hydra, gets carried away with pranks that are hurtful to others, Squish must make a decision. Friendship dynamics are so relevant for the targeted age group; as children pull away from their parents, they must navigate the muddy waters of peer pressure. Not all children can do this as well as Squish, who shows remarkable courage in this story. Bravo to the Holms for taking on this topic and for weaving it so well into Squish's world. Another graphic novel series by the Holm siblings, aimed at chapter book readers, but the Squish series doesn't have the magic of the Babymouse books. All the characters in this series are microorganisms. The color scheme is black, white, and green, since this series targets boys. Squish, an amoeba, loves comic books, especially his favorite superhero, Super Amoeba. It's a strength of this series, and a tribute to the power of literature in children's lives (yes, comic books are children's literature, too), that the issue of Super Amoeba that Squish is reading parallels whatever is going on in Squish's own life. As in the Babymouse series, there is an off-screen narrator who comments on what is happening in the Squish books. While Pod and Peggy are off at ballet camp, Squish is stuck at summer swim camp. He doesn't want anything to do with the water after a previous terrible experience, but the conselour is annoyingly perky and keeps encouraging everyone to have "super awesome fun". Luckily, he meets a friend who also doesn't want to swim, Basil, and the two try to avoid swimming and read comic books instead. Squish is also reading about his favorite comic superhero who has taken on a sidekick who has some evil tend While Pod and Peggy are off at ballet camp, Squish is stuck at summer swim camp. He doesn't want anything to do with the water after a previous terrible experience, but the conselour is annoyingly perky and keeps encouraging everyone to have "super awesome fun". Luckily, he meets a friend who also doesn't want to swim, Basil, and the two try to avoid swimming and read comic books instead. Squish is also reading about his favorite comic superhero who has taken on a sidekick who has some evil tendencies... just like Basil has a bad habit of using his stingers to inflict pain on unwary suspects. Can Squish survive swim camp? And will Pod manage to open a black hole... with a pirouette? Strengths: *Snerk* When I took swimming lessons with my brother in 1974, he spent every lesson hiding out in the bathrooms because they were WAY warmer than the northeastern Ohio lake! Squish is a bit anxious (like Mason Dixon), but I find his defensiveness about his fear much more believable that elementary grade neuroses! Squish No.3 The Power of the Parasite hits stores tomorrow and it is another perfect installment in the funny, smart, loveable series. Squish is an amoeba who is nervous to go to Summer camp. He must choose between swim camp and ballet camp and his friend’s have all chosen ballet camp. He’s scared to swim and meets a new friend Basil, who is also afraid to swim and makes Squish laugh. It doesn’t take Squish long to realize that maybe Basil isn’t exactly who Squish thought he would be. Sections o Squish No.3 The Power of the Parasite hits stores tomorrow and it is another perfect installment in the funny, smart, loveable series. Squish is an amoeba who is nervous to go to Summer camp. He must choose between swim camp and ballet camp and his friend’s have all chosen ballet camp. He’s scared to swim and meets a new friend Basil, who is also afraid to swim and makes Squish laugh. It doesn’t take Squish long to realize that maybe Basil isn’t exactly who Squish thought he would be. Sections of the book are pages from the comic that Squish is reading- Super Amoeba. The book also concludes with a simple science experiment and drawing tips. Created by Jennifer L. Holm and Matthew Holm, the creators of the hit series Babymouse, Squish is geared for both sexes and deals with universal issues in a subtle manner. Chock full of humor with a few bites of scientific information tapped in, the book is a real page turner and the illustrations are so cute and simple that they call to be looked at multiple times. This is marketed to kids age 7-10 but I could picture both younger and older siblings also taking a peek and sharing a laugh at the adventures of Squish. “Squish-The Power of the Parasite” by Jennifer Holm and Matthew Holm is a book targeted for third graders. This unique graphic novel is fun to read and is also educational with random little facts. The book is about a parasite who is about to start his summer. Squish, the parasite is terrified though because his parents have enrolled him into a camp for learning how to swim and Squish hates swimming. Luckily Squish meets a couple new friends to get him thru his summer. By the end of the book Squ “Squish-The Power of the Parasite” by Jennifer Holm and Matthew Holm is a book targeted for third graders. This unique graphic novel is fun to read and is also educational with random little facts. The book is about a parasite who is about to start his summer. Squish, the parasite is terrified though because his parents have enrolled him into a camp for learning how to swim and Squish hates swimming. Luckily Squish meets a couple new friends to get him thru his summer. By the end of the book Squish soon finds out who his real friends are and ultimately has a great summer by doing the right things. I think the book fits third graders because this age group is going thru similar experiences with friendships that they can easily relate to. The book engages third graders intellectually with facts as well as making it fun to read. Holm, J. L., & Holm, M. (2011). Squish. New York: Random House. School is out for the summer and everyone is signing up for summer camp. Squish's mom signed him up for swim camp while all his other friends are attending ballet camp. Learning a few lessons from his favorite superhero Sal the super amoeba and his new partner Parasite, Squish learns that standing up to others isn't always easy. Squish overcomes his fears at swim camp. "The Power of the Parasite" is appropriate for ages 7+ (Grades 2+). While reading this book I became a little confused between t School is out for the summer and everyone is signing up for summer camp. Squish's mom signed him up for swim camp while all his other friends are attending ballet camp. Learning a few lessons from his favorite superhero Sal the super amoeba and his new partner Parasite, Squish learns that standing up to others isn't always easy. Squish overcomes his fears at swim camp. Squish is off to swim camp for the summer. Both his friends went to ballet camp, though, so he's all alone. And, water is pretty scary. Squish meets a hydra named Basil who also doesn't want to swim. He's excited he's found a friend. But after a few days Squish starts to realize some of the things Basil thinks of funny are actually not nice. What should he do? Thankfully, his favorite comic superhero Super Amoeba is having similar problems with a new sidekick named Parasite, and Squish decides t Squish is off to swim camp for the summer. Both his friends went to ballet camp, though, so he's all alone. And, water is pretty scary. Squish meets a hydra named Basil who also doesn't want to swim. He's excited he's found a friend. But after a few days Squish starts to realize some of the things Basil thinks of funny are actually not nice. What should he do? Thankfully, his favorite comic superhero Super Amoeba is having similar problems with a new sidekick named Parasite, and Squish decides to follow his hero's example. Another good lesson for kids wrapped up in an entertaining package. A great pick for kids who may not have picked the best "friends" to hang out around. Time for summer vacation hooray!! That is until Squish is forced to choose between two summer past times: learning to swim, or learning ballet. Neither of these sound remotely enjoyable to Squish who would rather lay around reading comic books all day. But out of those choices what else is an amoeba to do? Out of the Squish books this one was my favorite so far. I liked that Squish was flawed, saw he was making bad choices, apologized for his actions and did better. These books are candy for eve Time for summer vacation hooray!! That is until Squish is forced to choose between two summer past times: learning to swim, or learning ballet. Neither of these sound remotely enjoyable to Squish who would rather lay around reading comic books all day. But out of those choices what else is an amoeba to do? It's summertime and Squish is going to swim camp. He's not super jazzed about it, but he makes a friend. Meanwhile, in Squish's comic book, Super Amoeba has landed a partner. When both new friends start showing their bad sides it's up to Squish and Super Amoeba to make some tough decisions. A fun, quick read, combining science, summer, and the realistic drama of friendships recommended for grades 3-5. This graphic novel is the perfect book for kids who are reluctant to read. The story of an amoeba during the summer, who attends swimming camp while his friends are at ballet camp, is funny and can definitely keep the reader's attention. The pictures to the comic-like book, are black and white with some lime green. The green in used to have parts of the illustration stand out. I thought this graphic novel was enjoyable and witty; the amoeba will keep you coming back for more! Jennifer L. Holm is a NEW YORK TIMES bestselling children's author and the recipient of three Newbery Honors for her novels OUR ONLY MAY AMELIA, PENNY FROM HEAVEN, and TURTLE IN PARADISE. Jennifer collaborates with her brother, Matthew Holm, on two graphic novel series -- the Eisner Award-winning Babymouse series and the bestselling Squish series. She is also the author of several other highly pra Jennifer L. Holm is a NEW YORK TIMES bestselling children's author and the recipient of three Newbery Honors for her novels OUR ONLY MAY AMELIA, PENNY FROM HEAVEN, and TURTLE IN PARADISE.